A year had then passed since the farmer mare and the unicorn pony had met each other for the very first time in Sweet Apple Acres. "For thousands of years ago both Princess Celestia and Princess Luna turned Discord into stone." Twilight read in her book. It were the evening after the Gala in Canterlot, as Twilight were reading her book. "Discord had cursed both the Everfree Forest, and the Everfree castle before he got turned into stone." the unicorn pony read. "The keepers of the grove of truth is in the Canterlot labyrinth." that's what Applejack thought, as she woke up after a nigtmare one morning on a sunny midsummer day. That thing about the keepers of the grove of truth have only been something ponies had as a filly story, so she went over to Twilight's library that summer morning. Applejack entered Twilights library that morning, as she told the unicorn pony about the nightmare. "That was only a nightmare I think." Applejack told the unicorn pony. "Ponies has told to see them in forests at night, but I haven't." Twilight said to Applejack. Applejack she had nightmares about the keepers of the grove of truth, as she was in the labyrinth by the Canterlot castle again. The farmer pony were thinking back on the day at the running of the leaves It was under the Iron Pony Competition at the last month of summer, and both Applejack and Rainbow Dash did not win. But there was still leaves to shake of, so the two ponies raced on in the sunny Whitetail Wood. The two ponies crossed the forest, and passed by several small villages under the way. Later that evening, as they found a shortcut to Ponyville where they greeted by their friends. The two ponies were tired after the long run, so they went to bed. That next day, was Rainbow Dash and Applejack talking about a vacation, so they went to Twilight and asked where to go. "Trottingham is a village with mines full of gold, and you have to make a full days jorney." Twilight said to her friends. "Rarity had only talked about it, and that place sounds interesting." Applejack said to Twilight. So later on, was Rainbow Dash and Applejack leaving Ponyville behind, as they was on the road to Trottingham. The two ponies crossed Canterlot, and went up in the mountains. They was both tired of crossing mountains, as they reached a forest. "I'm so tired that I can't walk any longer." Applejack said to Rainbow Dash. "Me too, but we have to cross this forest before dark." Rainbow Dash said to Applejack. The two tired ponies began to argue of which shortcut to take, as something ran through the forest. "Hurry up, and we don't have time to argue." Rainbow Dash said to Applejack. Something fast way on the through the forest, and the sun was setiting. The two ponies met with the Diamond Dogs, and they surrounded the ponies. "But hello what lovely forest." a dog said to the scared ponies. "I will protect you." Rainbow Dash said to Applejack. But before they knew it had two friends shown up. It was Soarin' and Spitfire, who came to the rescue. Soarin' and Spitfire knocked the dogs out, as they rescued their two friends. "Hey, I wonderw hat are you doing here?. 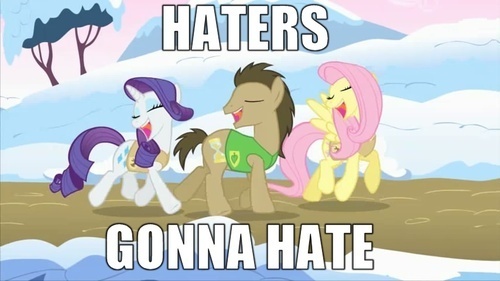 Soarin' told the two ponies. "We are on the way to Trottingham!" Rainbow Dash said to her two friends. "I have family there, but we better get going before more dogs shows up." Soarin' said to Rainbow Dash. The ponies went to the village quickly. The farmer mare felt asleep after that flashback. Some days later had a big diamond shaped rock from space been landing in the garden by Canterlot. Ponies from Canterlot had been send out to study the rock at Canterlot, but they could not figure out where it came from. Twilight she wrote to Princess Celestia about Applejack's nightmare, and the princess she wrote back that a rock had landed in her garden. Then was Twilight visiting Princess Celestia, and she showed her the rock. One day was Hayseed working in the sculpture garden, and he thought he heard the Discord sculpture crack while someone laughed. Hayseed he looked around, but nobody was to be found. "Nopony here and this must be something I had imagined." Hayseed said out loud. Pinkie Pie came by to see the statue, and Hayseed he told it was going to crack. "Impossible, our princess had defeated her according to Twilights older books." Pinkie Pie said while she used her Pinkie Sense. The six ponies had been gathered to a sleepover party in Twilight's library later that evening. At night had Rainbow Dash woken up in her bed by the vision of Cloudsdale collapsing. The others of the Mane Six could not sleep after they all had the same nightmare. Applejack was about to cry, as Rainbow Dash comforted her. "Don't worry Applejack you just had a nightmare just like me." the pegasus pony told the farmer pony and smiled. The months they passed, and one day was ponies from far away having chocolate milk as rain. Letters about chocolate milk was sent to the princess, as strange things happened In the meanwhile, was the statue of Discord coming alive. Discord was alive again after eons. and now he wanted to visit some he knew. "It's good to be alive again, and those ponies must pay with my chaos." Discord said to himself. The sun was shining over Ponyville, and he six ponies had nothing to do but enjoy that sunny day. Rainbow Dash she went home to Cloudsdale for a visit, as she saw some kind of strange butterfles her. "I wonder what that is." Rainbow Dash said to herself. Then she raced after those things, and it was some strange butterflies. "Hey Rainbow Dash Cloudsdale will no longer stand." the Discorded butterflies said to Rainbow Dash. "But I wonder why." a startled Rainbow Dash said to the Discorded butterflies. "Discord has arrived again." the butterflies told the pegasus pony. Rainbow Dash thought Discord was a filly story, and he knew something was brewing if it was real. "Go see for yourself, and and chaos will rule again." the butterflies said to the pegasus pony and flew away. Rainbow Dash she thought it was an illusion, but strange things had happened lately around. Chocolate rain, Applejack had nightmares about talking apple, and the statues became alive in Canterlot. Princess Celestia heard the ghost of Discord in her room, so she had to call her friends together. "So you think your stone spell worked, but no." an invisble Discord he said to the princess. "Just you wait until The Mane Six will stop you again." the princess said to Discord. "Invite the six up here, so I can have a talk with them." Discord said to the alicorn. Discord had stolen the elements without the princess had known about it in the meanwhile. Then the princess wrote to The Mane Six, who rushed up to the castle. Princess Celestia told The Mane Six about Discord who had returned to Equestria after over thousands of years again. Discord met with The Mane Six at the entrance at the labyrinth. "That can't be Discord, and I only heard about him in Cheerilee's school books as a filly." Applejack told herself. The six ponies got split up, and they all wandered seperate through the labyrinth. The farmer pony were walking through the labyrinth. Applejack walked and walked through the endless labyrinth. The farmer pony passed by secret gardens, sculptures, statues and more. "Whoa nelly, now I'm lost in this labyrinth." Applejack told herself. To Applejack 's horror she found the grove of truth as imagined.